Here’s a tip for you: if you want to travel incognito do not carry a huge silver cup around with you. 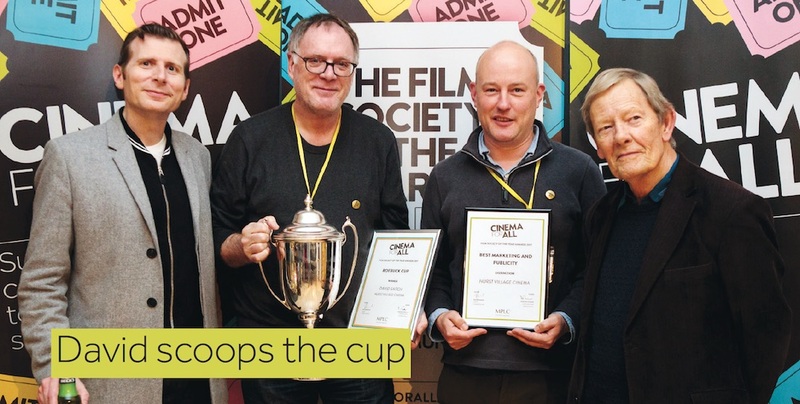 This is what David Saitch learned after being awarded the prestigious Roebuck Cup at the Film Society of the Year Awards at Sheffield last month. ‘Go on my son, champion’ shouted one taxi driver out of his window. Others honked their horns. Conversations were struck on up the train home and even on a London escalator at the sight of this huge trophy. The evening before, we were in our seats at the Sheffield Showrooms having been awarded a distinction for marketing earlier in the ceremony. I was very pleased and David looked pleased, although underneath I could tell he was chuntering about what more he had to do to win the darn thing. At least we get our photo taken with Danny Leigh and Derek Malcolm for our marketing award, I thought. It then occurred to me that I was wearing the same dark top I had been at the last two awards. Oh well, no one will notice. “…known to many for his attendance at this event, year after year, his continual support of groups all over the country…” Well, it’s a man this year, I mused. “… he has been running his own group for many years, bringing great cinema to his community in West Sussex”. In true sitcom fashion David and I exchanged a glance. “…several years ago he set up the UK Film Societies Facebook page to bring you all together…”.